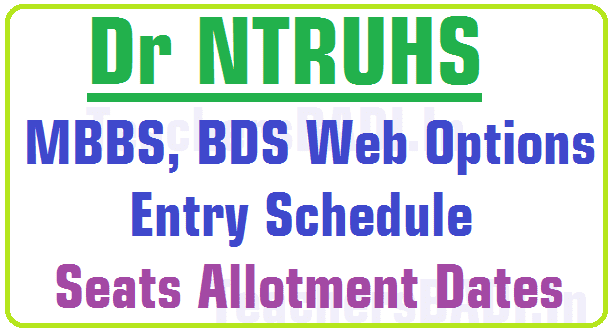 Dr NTRUHS MBBS, BDS Seat Allotment Results/Selection list results/ Seat allotment Letter Download: Dr NTRUHS MBBS,BDS Web Options entry dates/schedule, Seats Allotment Dates-1st phase web based counselling for exercising options for admission into MBBS/BDS Course for 2017-2018. Dr NTR University of Health Sciences/Dr. NTR UHS hereby notify that the first phase of web based counseling for exercising options the candidates those who have attended for certificates verification as per the schedule notified by the University are only eligible for giving Web Options for admissions into MBBS/BDS Courses for the academic year 2017-2018 in the Medical colleges located in Andhra Pradesh will be conducted as per the following schedule. Dr. NTR UNIVERSITY OF HEALTH SCIENCES: A.P :VIJAYAWADA given the Notification for exercising web options for 1st Phase of web based counseling for admission into MBBS/BDS Courses under MBBS-BDS 2017- Convenor Quota(A Category) for the academic year 2017-18. The qualified and eligible candidates figured in the Merit list was displayed on 22.07.2017 and they were invited to exercise web options from 5.00 PM on 22.07.2017 upto 12.00 Midnight on 25.07.2017 for 1st phase of web counseling for admission into MBBS/BDS Courses in the seats available under MBBS-BDS 2017- Convenor Quota(A Category) in Government, Private Un-aided Non-Minority, Minority Medical and Dental Colleges (under Dr. NTR UHS) and MBBS Course in Sri Padmavathi Medical College for Women (under SVIMS), Tirupati in the state of Andhra Pradesh for the academic year 2017-18. For detailed Notification, Seat Matrix and other details please refer the Website http://ntruhs.ap.nic.in / http://apmedadm.apsche.nic.in.